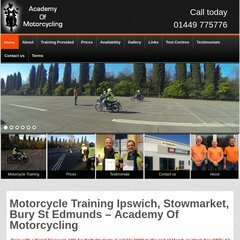 Topics: Compulsory Basic Training (cbt's), Training Provided, Compulsory Basic Training, Standard Test & Moped, and Theory Test Training. academyofmotorcycling... Academy of Motorcycling - Dedicated to providing the best ..
Its 2 nameservers are dns2.register.com, and dns1.register.com. Its local IP address is 64.29.145.9. Internetnamesforbusiness.com Florida is the location of the Apache server.